Discussion in 'Trux Discussion Area' started by Dave55, Sep 30, 2015. Bradley mentions in 'A Soldier's Story' that when he visited Montgomery's headquarters in Normandy that, "A signal detachment and a security guard equipped with black American Jeeps rounded out the tiny caravan camp." Sounds kind of interesting. Anyone have any more info on these jeeps? On the two occasions when I saw Monty, the first in North Africa, the second in Sicily, he was very much in a dirty, brown, dusty camouflaged jeep. Could it me that they were painted in "Mickey Mouse Ear" pattern camouflage? This would mean that all parts of the vehicle visible from above would be black and possibly other parts of the vehicle. 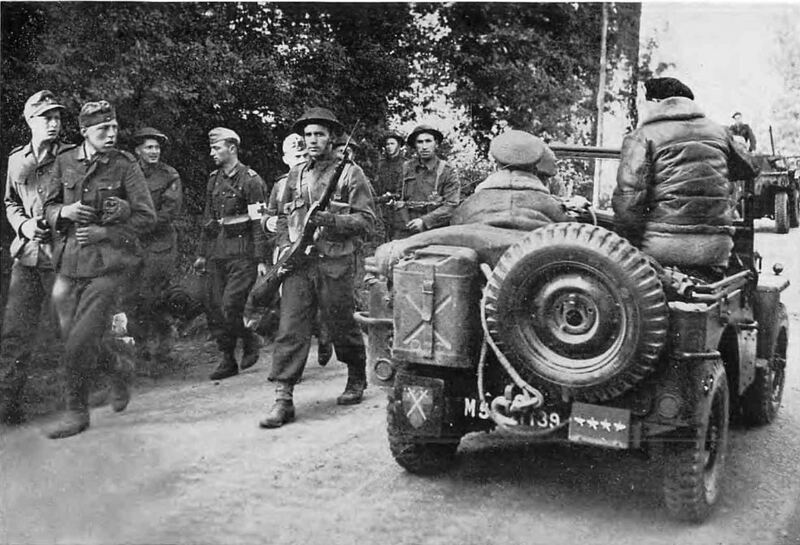 I don't think it was usual to apply camouflage patterns to a jeep but I have seen several photos of then in M.M.E. camouflage. Purely from my own scouring of photographs of NW Europe - though not any specifically of Monty - I would support Noel on this one. At the risk of seeing what I want to see, this picture seems to be darker at the rear on Monty's side than the other and might be a lead? But completely black jeeps - bad camouflage if nothing else, methinks. Dave55 and dbf like this. Good find. Sounds like it was his security people there. Goggle also shows several pictures of MME pattern jeeps and trucks, which are very neat looking but no 'gleaming black' ones like the one mentioned in that link. Wonder what became of them.